The other day I made some lovely fresh spelt milk (read about our recipe HERE) and, as always, the spelt pulp was left over. I usually throw it away, thinking there is nothing to be done with the used spelt but, as you know I hate to waste food stuff so I got to thinking. What could I make? Well, having just thought about buying my own waffle iron there was the only thing on my mind – waffles. So I did a little experiment and ended up with some yummy yummy waffles. 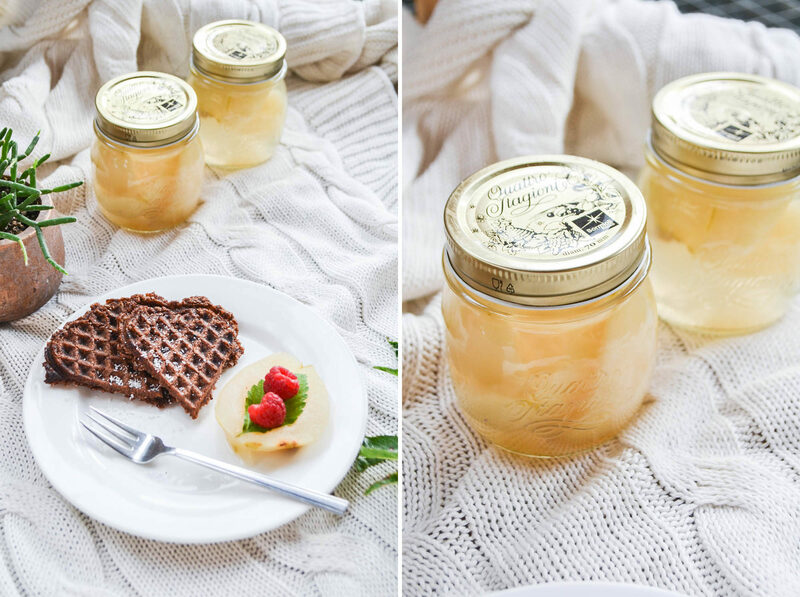 While I was making them, my sister whipped up a tasty pear-ginger compote as a topping. Waffles. Waffles. 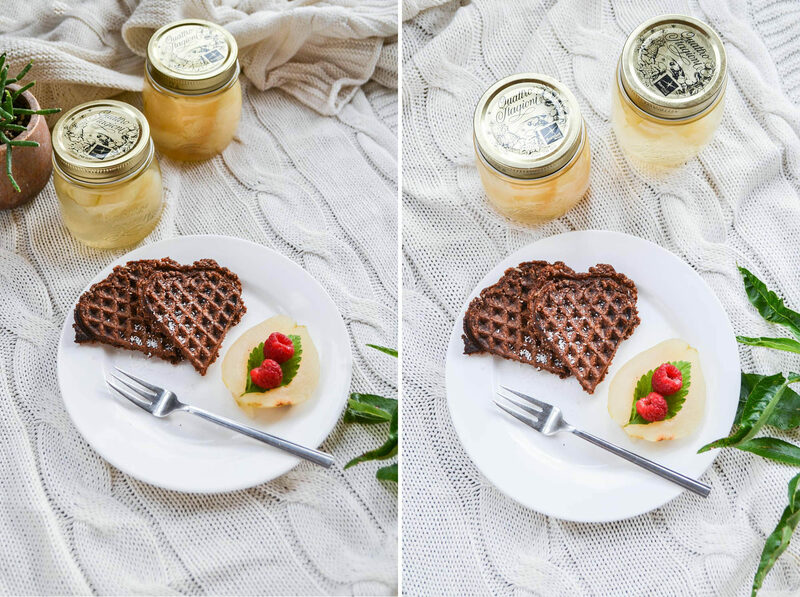 Feel like eating waffles yet? Here’s the recipe. 1 cup leftover, wet spelt pulp from your home-made plant-based milk (use gluten-free grains for the GF version. Maybe even ground nuts?). 1. Put all the ingredients for the compote (besides the pears) in a large pot and and boil them up. Let the mixture simmer for about 10 minutes. 2. In the meantime peel and cut your pears. After the 10 minutes add them to the hot ginger-water. 3. Decoct some jars and fill in the (still almost boiling) compote. Close them with lids and let them cool for some hours, they should form a vacuum inside. 4. For the waffles put all the ingredients in a large mixing bowl and stir well. The batter should be moist but not too liquid. If your consistence varies, add more water or flour. 5. 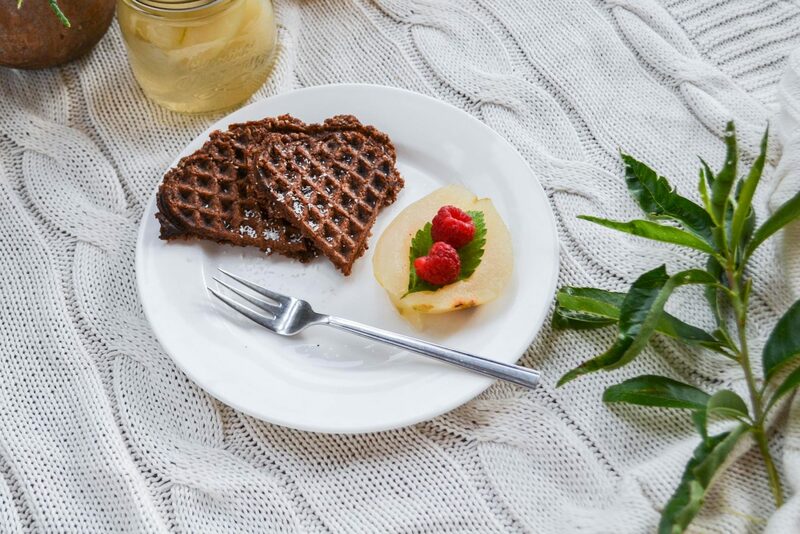 Put two tablespoons of your batter in your waffle iron and bake the waffles until they are crispy at the outside. 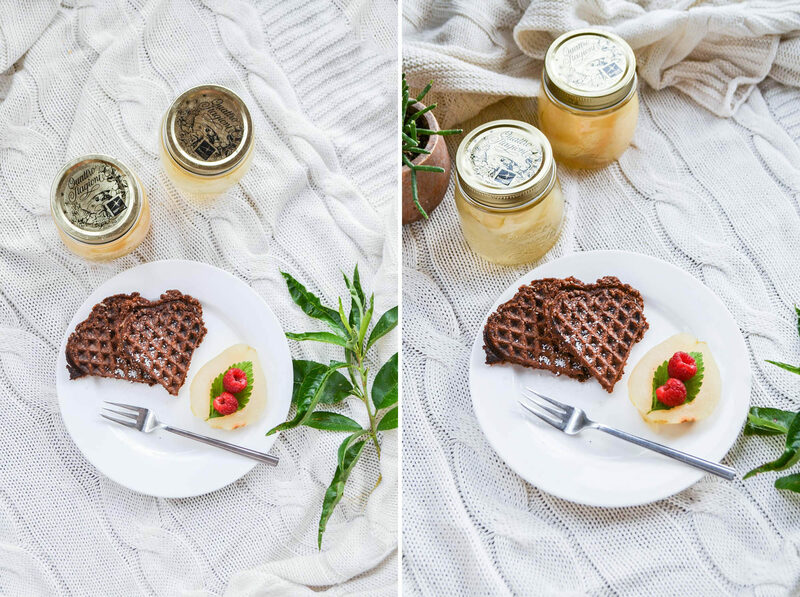 Don’t open your waffle iron too soon: Your waffles might get torn apart. 6. 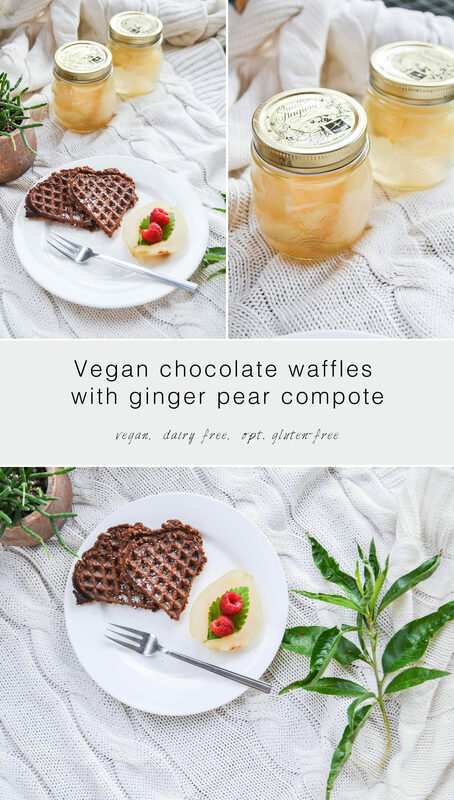 Serve the vegan chocolate waffles with the ginger pear compote. If you did it right and there is a vacuum in your jars you can store the compote for several months at a dark place. Dieses Rezept werde ich definitiv n nächster Zeit ausprobieren. Sind fantastisch und verdammt lecker aus! Von Waffeln kann ich gar nicht genug bekommen. 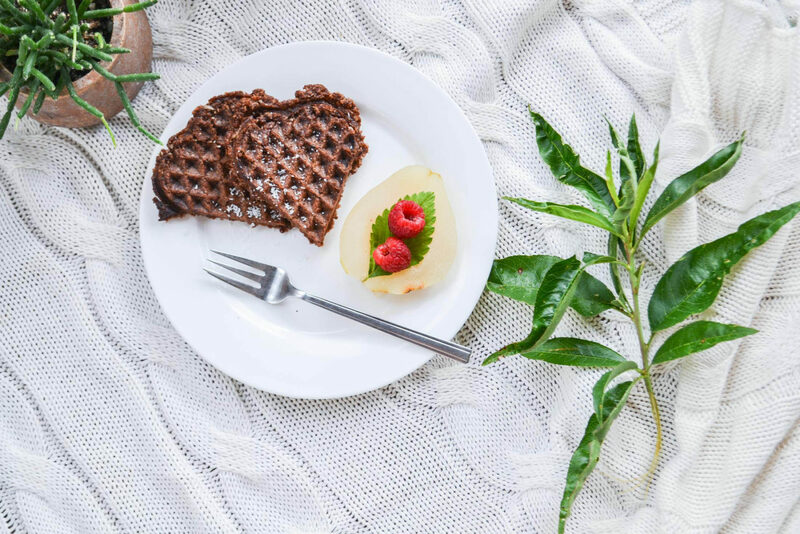 Das Rezept klingt super lecker und ehrlich gesagt ist es mir neu, dass es Waffeln mit Schokolade gibt. Grandiose Idee.